No more press printing & handwriting paper works. 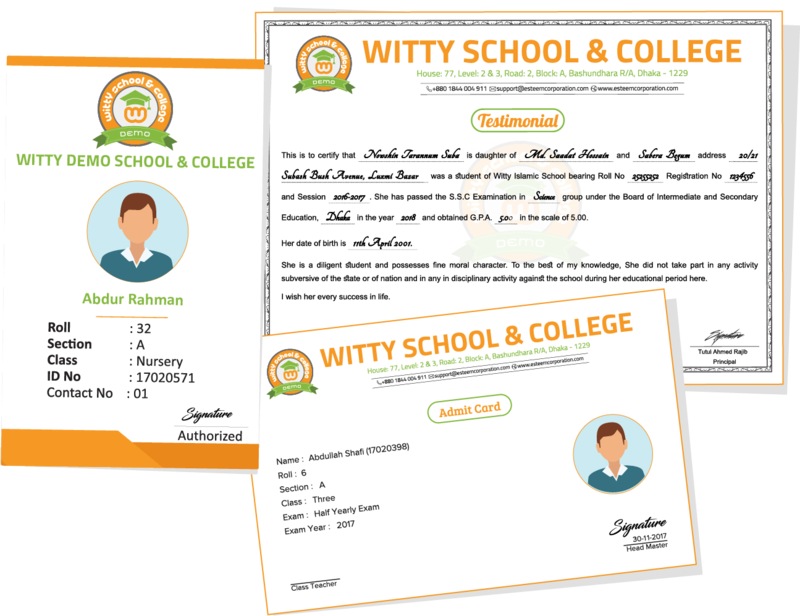 Generate interactive & fully dynamic exam admit card, student ID card, exam seat plan, guardian ID card, testimonial, transfer certificate & studentship certificate instantly which will reduce your cost & mistake. Automatically generate tabulation sheet, result reports, score sheet, subject based grade analysis, grade/GPA based result analysis report, failed student list with subject name & marks. There are other various exciting reports which will help to analysis the student progress & development. Manual attendance days are over, now take student & staffs attendance quickly & easily. Take attendance either with biometric fingerprint or through RFID card. An android and iOS based mobile app for faster access of students profile, accounts profile, payment history, class routine, homework, lesson plan & many more. Instantly know your payment information with paid & due amount. Easily & effortlessly pay the invoiced amount from any place with just a click. From wide range of payment option choose the one that meets your needs. Pay either with mastercard, visa card , rocket , bkash or other famous payment options.